Annie Skates : Director of Capital Voices. A force to be reckoned with, she has worked with Madonna, The Jacksons, Beyonce, Elton John, Lionel Richie, Robbie Williams, Kylie Minogue, Annie Lennox, Gloria Estefan, The Bee Gees - the list goes on and on! She is also the go-to vocal... coach for numerous stars - credentials include Rami Malek in Bohemian Rhapsody and the cast of Mamma Mia 2, the X Factor, Britain's Got Talent, America's Got Talent... and she has done vocal work for the likes of Evita, Nine, Entrapment, Phantom of the Opera, to name a few. We can't even fit in the rest of what she's done in this humble post - what a CV!! Yona Dunsford: a supremely talented vocalist, Yona has worked with Randy Crawford, Jermaine Jackson, Bjork, Michael Ball - and has also sung on Mamma Mia 2, The Phantom Menace, Evita and more... wow! Emma Kershaw : She's worked with Little Mix, Kylie Minogue, Robbie Williams, Alexandra Burke and many more. Film credits include Lion King 3, Asterix, Pirates of the Caribbean, and more! TV appearances include the MTV Music Awards, The Laurence Olivier Awards, X Factor Final, The Royal Variety Show and, you guessed it, many more! CJ Neale : not only is he a singer, he's also a whizz with accountancy as he's a bookkeeper as well! Numbers aside, he has worked with Adele, Jamie Cullum, Rumer, Vince Gill, The Swingle Singers.... and as for films, he's done Galavant, Beauty & The Beast, Alice Through the Looking Glass, Mary Poppins Returns, Justice League, Jurassic Park, Avengers, erm, the list goes on an on! David Combes : Where do we start and stop with dashing David? He has worked with Beyonce, Elton John, Annie Lennox, Lionel Richie, Kylie Minogue, Robbie Williams... and more. Movies to his credit include Mamma Mia 2, Nine, The Corpse Bride, Pirates of the Caribbean... and he's done a lot more as far as live performances go, including performing for Her Majesty the Queen’s 90th Birthday Celebration concerts! Andrew Playfoot : From many West End theatre shows to films and albums, Andrew has also done it all. He's worked with Take That, Adele, Will Young, Robbie Williams, Westlife, Clare Teal - and he's sung on movie soundtracks for Mamma Mia 2, Aladdin, Dumbo, Mary Poppins Returns, Shrek 2 and many more. Wow - what a stellar team! In our next post, we will tell you more about our other singers, Sandra Marvin, Miranda Wilford and Damien Flood. The Spice Fusion 18-piece Big Band with strings will continue their album launch, Trying Hard 2, at The Royal Northern College of Music on Sunday 3rd March 2019. Another great show not to be missed - book your tickets here! The Spice Fusion 18-piece Big Band with strings will be launching their highly-anticipated second album, Trying Hard 2 at The Cadogan Hall in London on 1st March 2019. This is one show not to be missed! Book your tickets here! For one night only, the Spice Fusion band will be performing for their dear friend, Sarah Spencer Stonehill, who is sadly and sorely missed. Date: Friday 20th October, 2017, 8pm. Tickets are £25 and all proceeds will go to Countess Mountbatten Hospice Charity. Here's our line-up... and the name-dropping is only a fraction of the number of people our band members have worked with! Yesterday we announced that the legendary pianist, David Benoit will be featuring on our next album (did we mention how excited we are?). Why not see him live this week at Pizza Express? What's more, our drummer Elliott Henshaw will be performing with David, so a double bubble as far as treats go! David Benoit's list of awards and achievements is long and includes multiple Grammy nominations and a Lifetime achievement award in the field of smooth jazz. He has done 25 solo albums and has collaborated with legends such as Peter White, Rick Braun & many others. He is also the conductor of the Asia America Symphony Orchestra. For more information, visit Pizza Express's website here. It's 2017 and we've got quite a few updates to share with you. We're working away on our second album so lots of cogs are whirring away! You can also read more about Oliver Lewis here. It's been a while since we've done an update here, but that doesn't mean we haven't been busy - quite the contrary! We've done loads of gigs (a combination of us being the band-of-choice for other acts, as well as us doing our thing for various events) and we've got a load of gigs lined up over the next few months. We're doing it again - we're going to back The 4Tunes on Saturday the 27th of February, 2016 at The London Hippodrome Casino. We must be doing something right! These guys are so much fun to work with and incredibly talented. Fancy coming along to see us? We'd love to see you there! For the first time ever, there will be two Spice Fusion bands performing on the same night - Friday 20th November must be a lucky date for us! So - due to popular demand, The Spice Fusion sextet will be backing The 4Tunes at The Hippodrome Casino in London - get your tickets here. The other gig will be with The Spice Fusion 10-piece band, performing for The 100 Property Club at The Intercontinental Hotel in Park Lane, London. This will be for a private party, and we sure look forward to performing for such a high-flying club at such at prestigious location! 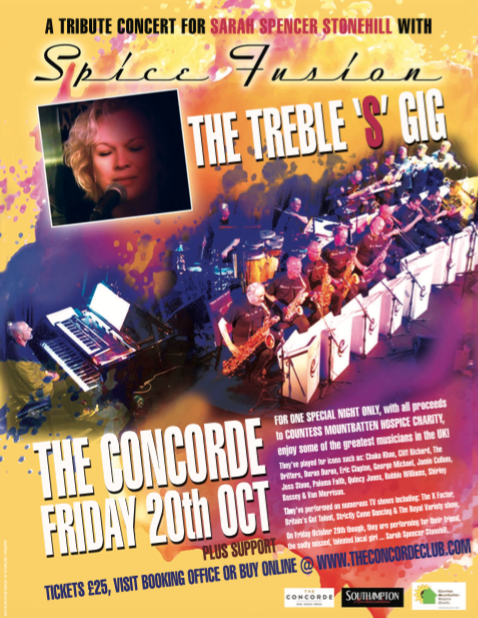 Do drop by on Friday 20th November at The London Hippodrome Casino - the Spice Fusion band would love to see you there! Are you ready for the Halloween weekend? We are! Tonight (30th October 2015) we'll be kick-starting the vibe with our sextet band backing The 4Tunes at The London Hippodrome Casino for a private party. Not invited? Fear not! We will be back tomorrow (31st October) at The London Hippodrome Casino doing a "public" version of tonight... The Spice Fusion sextet backing The 4Tunes. Get your tickets here - we'd love to see you there! The Boatyard: Combines the benefits of a modern purpose-built restaurant with the classic surroundings of the Old Leigh fishing village, not to mention the excellent food. Contained within what was previously a working boatyard, the building has been converted into a beautiful restaurant. A panoramic polarised glass frontage provides uninterrupted views of the Thames Estuary and Two-Tree Island Nature Reserve. Even more spectacular views can be obtained from the stunning wooden deck which juts out into the water and spans the entire width of the building. Book now on 01702 475588 - and see you there! Normally Spice Fusion is quite a big band with 18 musicians and a fine selection of singers - but for our next gig we will shrink down to six musicians (and still produce a large sound!). We are very proud to be supporting the fabulous Zoe Tyler at her gig on Saturday 10th January, 2015 at The Hippodrome Casino, London - you can book your tickets here. Stuart Brooks: has also gigged with Björk, has probably been your ear-worm many times as he’s ...played in 100s of films and TV shows, and he loves classic cars. Will Smith: no, not THAT Will Smith... but this Will is just as good-looking, has his own West End show (Top Hat), and loves teaching. Gabriel Garrick: has played for Princess Diana at Kensington Palace, started playing the trumpet when he was 7, and very wisely says "through music we can find the ultimate manifestation of life" - amen to that! Sid Gauld: has also gigged with George Michael, has recorded on over 300 albums and he is definitely worth his weight in Gauld! See you on the 23rd December at The Hippodrome Casino in London!